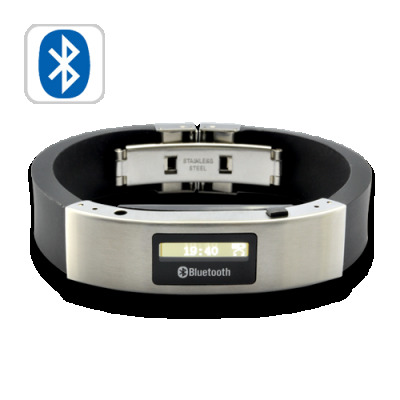 Successfully Added Bluetooth Bracelet with Vibration and LCD Display to your Shopping Cart. Bluetooth bracelet with vibration function and caller ID display. Have you ever missed a few calls on your cell phone because it was on silent mode or you just didn't hear your mobile phone ring? Then this new Bluetooth bracelet is bound to be your new best friend! It comes in a nice looking rubber & metallic matte finish and is both comfortable and fashionable to wear. Just use the Bluetooth bracelet as you would a normal Bluetooth device, it is very simple and very straight forward to use. The Bluetooth bracelet vibrates when you receive calls and displays the caller ID's number so you can decide whether or not you want to fish your phone out of your pocket or bag. If you are too busy to take calls then just press the function button to reject the call, thereby allowing you to pay more attention to your meeting. This Bluetooth bracelet not only looks cool, but also makes your busy life just that much easier to handle. Available now for your single piece sample or stock orders. Brought to you from the leader in direct from China wholesale electronics, Chinavasion. How do I pair this Bluetooth bracelet with my phone? When the bracelet is turned off, press and hold the button on the bracelet until the screen displays"Pairing." Only let go of the button once the screen shows "Pairing." Then you can connect your phone to the bracelet just like you would connect to any other Bluetooth device. Will the bracelet display my contacts' names? No, it only display the phone number. It works just as it suppose too. Chinavasion will be my new spot for electronics from here on out I love the bracelet. The product description is accurate about the range. Be aware that the bluetooth transceiver appears to be a Class 3, with a less-than-10-meter (<10m) range. It will work well if the phone is in your pocket or purse, but not if your phone is acroos the room (or down the hall in another office). This is my first time using Chinavasion.com, and was very pleased with the experience. It arrived just a couple days after ordering (via DHL), which is amazing. The device was well-packaged and in perfect working order. I'll definitely buy again. it's great, it's realy good.